As detailed in the 5G Pan-EU Trials Roadmap Version 4.0 (https://5g-ppp.eu/wp-content/uploads/2018/11/5GInfraPPP_TrialsWG_Roadmap_Version4.0.pdf), experimental platforms for 5G developments and trials in EU are the results of private and public efforts at national and EU level. Accelerating trial capabilities and other pilots, the platforms remain subject to continuous efforts targeting the full 5G picture and future evolutions. As such, the future roadmap of actual 5G infrastructure deployment is highly dependent on the capability to up-date existing or deliver a new relevant and comprehensive set of platforms addressing the remaining gaps and challenges. One should also consider platforms as valuable and demonstrated set of 5G enablers, beyond trial objectives. In order to increase the complementarity of the available platforms and the forthcoming developments, tight coordination is needed, including first in the documentation of the platforms. It is of tremendous importance to describe the matching elements of each platform compared to the complete 5G landscape. This documented orientation helps 3rd parties to assign their interests to the respective platform purpose. To boost access to 5G platforms, it is necessary to help different stakeholders on their knowledge level to identify the right platform targeting their interests. Therefore a common classification and documentation for 5G platforms addressing different target groups is mandatory. Consistent data structures and unified meta information like name of the platform, countries where the platform is deployed and additional information on features and capabilities is fundamental. The data collections provided by platforms have to support questions from diverse stakeholders including research, public sector or industry. 5G Infrastructure PPP Phase 3 platforms projects (2018-2021) started in July 2018 and provide a pan-EU large-scale end-to-end 5G validation network infrastructure, covering about 20 EU sites and nodes on a pan-EU basis. This infrastructure will provide the adequate level of openness to make it possible for vertical industries to test their innovative 5G business cases using ad-hoc network resource control in an end-to-end interoperability framework. The key platforms and cities of the PPP Phase 3 platforms projects are summarized in the geographic cartography presented in the following Figure. The key capabilities and features of the PPP Phase 3 platforms projects are summarized in the following Table. It should be noted that (1) capabilities will be incrementally added until the end of the projects, (2) interworking refers to interconnection of two or more sites to provide unified service(s) in the 5G E2E facility and interconnection does not assure interworking, (3) integration will be developed/funded by ICT-19 Vertical Pilots projects and (4) exact time line will be communicated after evaluating ICT-19 needs. The notes (2), (3) and (4) apply as reported in specific corresponding capabilities rows. June 2021 Oslo, Kongsberg, Martlesham, Patras, Madrid, Aveiro. Hosting of 3rd party VNFs(3) Turin, Madrid, Paris, Athens. Distributed Data fabric service for analytics – Oslo, Kongsberg, Patras (TBD), Madrid. 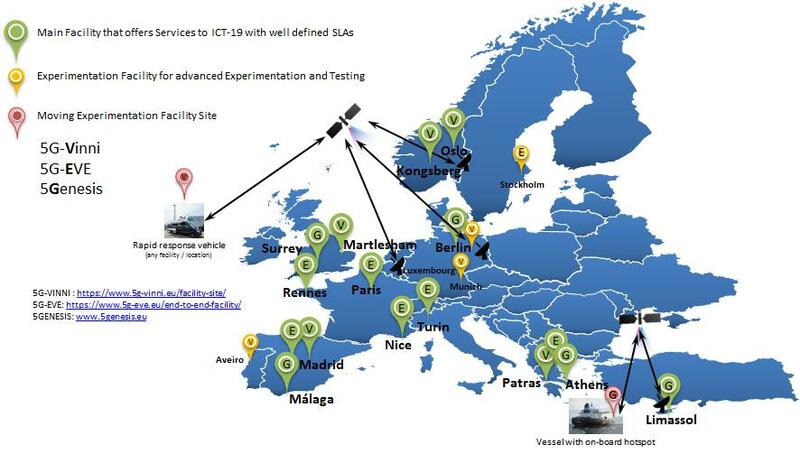 Beyond the 5G Infrastructure PPP Phase 3 platforms projects cartography, an inventory of available 5G platforms in EU and their functionalities is currently under development (https://www.ip45g.de/en/5g-testbeds/). It describes the supported technologies and functions of platforms compared to the complete 5G target landscape. This inventory boosts the access to 5G platforms, by helping the different stakeholders (research, public sector, industry…) identifying the right platform (common classification and documentation) for their interests.